Normally – practically always, as a matter of fact – the embroidery projects I work on are mounted on an embroidery frame or in an embroidery hoop. For some types of embroidery, it’s essential to use a hoop or frame. Goldwork and silk embroidery (like the Medallion project, this goldwork pomegranate project, this goldwork and silk Agnus Dei project, the little Tudor rose, and so forth) absolutely require that the work is mounted on a taut frame. Crewel embroidery (i.e. this crewel rooster) also benefits from mounting in a frame or hoop. There are other types of embroidery, though, that don’t necessarily need to be worked in a hoop or frame. The skilled embroiderers of Madeira, for example, worked their delicate and beautiful whitework motifs without a hoop, in their hands, with their worked wrapped around a finger to gauge tension. And certainly, there are many situations where embroidered linens and the like – adorned with typical surface embroidery stitches – can be easily held and worked in the hand, without the use of a hoop. Today, let’s chat ourselves up a bit about working in hand, without a hoop. 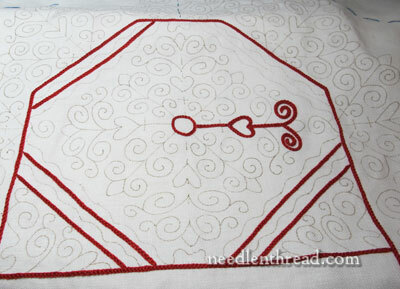 On the Hungarian Redwork Runner project, I decided not to use a hoop. A few reasons steered me in that direction. First, the Hungarian Braided Chain Stitch is the dominant stitch in this project, and, worked with a heavier thread (perle cotton #8 in this case), it is a chunky stitch. Even with a hoop that’s been bound and padded, I knew it would be difficult, once the embroidery was filling in, to pop the hoop easily on and off and to avoid flattening the chunky stitch. Now, don’t get me wrong – when using a hoop in regular surface embroidery, it is perfectly normal and permissible to move the hoop around over previously worked embroidery. Take, for example, a kitchen towel (like a white cotton flour sack towel) that you’re covering with hand embroidery. You can move your hoop from one section of the embroidery to another, even closing the hoop over previous stitches. The stitches may initially flatten a bit, but once you’ve finished the project, rinsed it, and dried it by whatever means you use, the stitches will rejuvenate themselves and look fine. Just remember to move your hoop and adjust it with care when placing it over other stitched areas. A bound embroidery hoop is always the best option in such circumstances. The binding gives the stitches at least a little something to sink into, anyway. So Why Not Use a Scroll-Type Frame? There are good frames out there that would counteract this whole hoop-moving question. For example, the Millenium Frame would be a good frame for this type of project. The project could be easily rolled around the rollers, exposing only the parts to be stitched, and the piece could be kept taut, and I’d have two hands to work with. Second, I’ve been wanting to work a whole project in hand for quite a while, because it’s not something I normally do. But I want to be able to tell myself I can do it – or have done it. It’s a question of broadening the old Experience Bucket, if you know what I mean. There was, once upon a time, an elderly lady living here in my town with whom I’d talk about embroidery when I was in college. She would really encourage me to pursue my interests in needlework all the time. Every time I ran into her, she would push me again in some needlework direction. She herself worked beautiful whitework embroidery on linen, and she never used a hoop or frame. She said she never learned to use one – she wished she had, but it was too difficult for her now to learn a different way. It’s like using a thimble or not using a thimble. Or driving an automatic and never a standard car. If you get used to one way and never try the other, eventually it becomes difficult to learn another way. What I’m finding about working in hand is interesting. It definitely takes a while to get used to it, if you’re used to working in a hoop or on a frame. One of the greatest advantages of working on a frame (besides the tautness of the fabric) is the fact that you have two hands free to work with (if you’re using some sort of stand, which I do). When you’re working in hand, that isn’t the case. 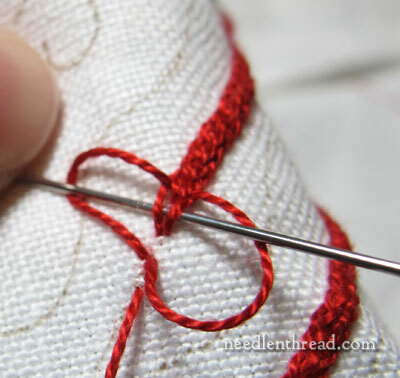 But you quickly learn how to make use of the hand holding the work – you find ways to stretch your thumb, for example, and hold onto the needle while you’re dominant hand does something else, like tightening up the working thread. You also discover ways of assuring proper tension. When you’re working in hand, you really have to be extra careful of the whole tension question. But after a while, you definitely get a better feel for tension, because your fingers are in closer contact with the fabric and the embroidery thread. 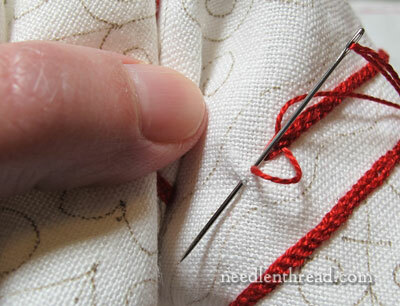 You have a more tactile impression of what’s going on with the thread and the fabric as you take a stitch. And wow – the fabric really gets bunched up and wrinkled when you work in hand. In a project this large, quite a bit of the fabric is bundled in the other hand. This may legitimately lead to a concern for the cleanliness of the project. After all, I’ve got my grimy paws all over the thing, and when I’m working in a frame or hoop, I don’t generally touch the fabric much. Besides washing my hands regularly (always before stitching), there’s the fact that the piece will be cleaned and blocked at the end. This is a piece made for laundering. It can be washed without a problem. Another thing I noticed when I first started the stitching was that my hands got sore. I am not used to holding the fabric this way. It seems to put a whole different group of muscles to work! The soreness has worn off pretty much, now – it just took a little bit of getting used to. So, what about you? Do you ever work without a hoop? (There are some stitchers, I know, who never, ever use a hoop or frame.) Do you always use a hoop? What are your thoughts or concerns about using or not using one? Any tidbits of advice or information you’d like to share with others on the subject? Or any questions, comments or suggestions about stitching in hand vs. stitching in a hoop? Feel free to have your say below! November 10, 2012 Testing Embroidery Threads: Colorfast? I generally work with out a hoop or frame. But there are some projects I’ve done that would have benefited from a hoop. I’m mostly working very thick fabrics (items done in nalbinding) so a hoop isn’t possible for these. Interesting post, Mary. It’s fun to see how other needleworkers work. I stitch with a combination of all forms of fabric handling; hoops, stretcher bars, frames, in-hand. Most of my work on countable ground is done on some sort of frame; the embroidery is usually done in-hand. The exception would be small counted pieces done on paper or other sturdy groundm, like the Mill Hill Santa ornaments. I think it’s because I tend to use the stab method when I’m doing counted work, but the sewing method when I’m doing embroidery. I even do Brazilian embroidery in hand most of the time, and that’s considered a no-no in the BE community. But it works for me. Remember to relax your hands every so often. Stitching in hand for too long can cause cramps and other problems. Two comments on working in hand rather than a hoop. First, it is more comfortable for my shoulder, neck, etc., to work in hand as I can move around more easily. Secondly, for me, there is a real sense of pleasure as the piece begins to be worked as both the sound and feel changes. I hope this last comment doesn’t sound too weird. Thanks so much for this post. When I first started needlework 2 years ago I started with cross stitch and embroidered a table cloth with the pattern already traced, i didn’t use a hoop/frame and found it easy to sew without them and you are more mobile you can sew anywhere. But since using a hoop/frame I have come to realise the importance of tension in needlework and until I am more experienced like you at sewing I would not attempt such a project without a hoop or frame. I love the photos you make me want to follow you on this project!!! Hi, nice article about not using a hoop. I only make cross stitches, LOL, so tension is not a big deal for me. I would love to use a hoop or frame but my left hand can’t take it, no matter how long I keep trying, or exercises or stretches or frequent breaks. I do use a stand up frame for larger pieces so I can work with a double ended needle (two hands) but I work large projects less and less these days. So I am basically a no hoop girl. It’s funny this has come up today, as I was just going through whether to use a hoop on some small embroidered designs. I find it depends on the day, and my mood to be able to control the fabric without a hoop. Personally, my hand tendons and muscles prefer not to use a hoop. Also, I find I have less neck stiffness without holding a hoop. However, I must be determined to stop and check the tension of the fabric very often. If not, it could be a sorry sight. What might make a difference is that I never embroider very large projects – just embellishments and childrens’ projects. Have a blessed day!! Hi Mary, Good discussion today. On small projects I use a hoop. I have the hoop that you sit on and hoops come in various sizes. Generally I use stretcher bars and brass tacks. I find my work stays very tight and really does not loosen up. I probably use this technique because worked in a needlepoint shop and that’s how we put our canvases. Questions, Mary, do you ever use a slate frame? I have one and only used it once. It’s very time consuming. Some people say to never use a hoop. As you move around the project the hoop leaves crease marks that you can never get out. It seems to stay clean so I don’t wash my work as after being stitched. So my question is, do you ever have the problem with crease marks that you could not remove w/o washing? I use a slate frame quite often, actually. The Millenium frame has become a close second to the perfect tension that can be had with a slate frame, with the advantage that it is a whole lot easier to set up. But once a slate frame is set up, it’s perfect for long-term projects. I really love using them. If you pad your work in a hoop, or if you bind your hoop or cover it with another cloth (muslin for example) in the hoop and then cut away the center area so you can stitch, this helps keep the fabric clean and free from rings of dirt. It doesn’t, however, help keep it from hoop creases. I never use a hoop on something that can’t be washed or at least dampened for blocking. If the thing can’t be dampened, it’s pretty unlikely that all the hoop marks will come out with ironing. The only exception would be if the design fit easily inside the circumference of the hoop, so that, when the finishing is done, the hoop rings wouldn’t be visible, anyway. But on projects like that (projects that can’t be washed – like goldwork and so forth), I normally would use stretcher bars and tacks, a Millenium frame, or a slate frame, anyway. At the present time I’m recreating a small Methodist my great grandfather helped to found in or about 1880. I’m working from a pencil sketch my cousin made some 50 years ago (we share the same relative). I would rather do this without a hoop, but straight lines are important and I’m unable to judge straightness without the aid of a hoop. That sounds amazing I would love to do something for our church so they would remember me when I’m no longer on this earth but walking with Jesus on higher ground. But firstly would love to do one to glorify God. Could you put a picture of your article on here or email it to me not to copy just to admire please. I have never taken on a large project before my biggest was for my son i recently did..he’s moving to live in Thailand with his work for 1 year and I wanted something that he would remember us all with. What words are on your work for your Grandfather’s church I’m so curious about it. I saw one done in a different church to ours and it must’ve been approx 5yds long by 4/5 ft wide made as a very long banner it was amazing. It would surely need a very thick stitch to be seen and read what stitch are you using? I apologise for all these questions but I have find that so very interesting..Thank you anticipation. I work without a hoop or frame when I think I can get away with it. One tip (which you may have already discovered) for coping with the fabric you’re holding in your off-hand: roll or fold it neatly and tie some loose loops or something to hold the folds in place. That way it doesn’t get wadded up quite so badly and you just might end up with fewer wrinkles in the finished work. I work mostly in felt appliqué and felt embroidery, so hoops and frames are impossible and impractical. I have on occasion used small hoops for towels or small decorative projects, but find that if the hoop is too big, I have difficulty holding the hoop and working the needle. I have never used a stand to sew, so working with two hands to embroider would be a strange experience. My right arm and hand definitely do the lion’s share of working and moving. I find that sitting in a tailor’s position (legs folded or crossed in front while seated with a straight back) helps quite a bit and is fairly comfortable to do on the couch. It is nice to be able to sew anywhere if I wish. I wanted to add, I wash my hands frequently when sewing. I can feel them start to get greasy, sweaty, or just “dirty”-feeling, and it’s a good time to take a break and run some warm water and soap over them. I do lots of felt embroidery too and never use a hoop for it. Just doesn’t seem necessary, and it’s nice to be able to take whatever I’m stitching up with me anywhere I want without lugging around a hoop too. I do generally use a hoop when working with cotton and other fabrics that are less stiff. Otherwise I tend to stretch the fabric out funny and the end result just doesn’t look right. It depends on what I am stitching. I usually used to only do in hand, but when I started using a scroll frame…I found all my stitches looked better because I got better and a more even tension. I normally work on28 to 36 ct linen except when doing towels. Now even my surface embroidery on towels in in a hoop. Nice post, Mary. Thanks for sharing and for the pictures. I almost always use a hoop, just because for me it is easier to have the frame hold the fabric. I have also worked small and large projects without a hoop or frame. You covered the pros and cons pretty well. One consideration I have about working especially a large project (whether in a hoop or frame or out) is that besides my hands needing to be clean —— I get cat hair on whatever I’m working on. And I found that if I work without a hoop the cat hair multiplies. I also have a dog. Tweezers are a great idea if the fur is in the stitch itself. I keep one of those “sticky paper” on a roller nearby to roll over my fabric occasionally. It helps remove a lot of the fur before it gets picked up and included in the stitch. I will keep a pair of tweezers nearby also. Thanks for the suggestion! Animal hair, human hair, dust, fluff… you name it and it has landed on my needlework at some point. As someone mentioned before, when not working, I keep my work covered. When working, I have tweezers at hand to keep extraneous stuff from my stitches. I use scotch tape to pick up lint and stuff from the fabric. Like the lint roller it picks up stray items. I prefer tape because I can get close, but not disturb the threads. I like working in hand. I even do some needlepoint in hand. I find it much easier to place my stitches and to control tension. I find I have less tendency to bend over my work and have less back and neck pain. This was helpful for me to read, Susan. Bending over my work is a large concern for me, since I have a crunchable, osteoporotic spine. I should probably give up doing needlework altogether, since I’ve been warned against 1) sitting for extended periods, 2) bending forward over a table or frame, and 3) remaining in the head-downward position (as in, looking at your work!). But I can’t give it up; it is the thing that I love. I’m trying to come to terms with “acceptance”–that is, acceptance of the fact that the activity I love doing more than anything else is now “not good for me.” I will try practicing in-hand and see if I can remain more upright. Thank you for your helpful comment. Having a hoop was not an option growingup! I finished my first piece at 7, a kit I begged my aunt to buy me. I fell in love. I just gave my aunts cookbook cover, cookbook included, to my 16 yr oldculinary student granddaughter Emily. I made it 40 yrs later fir that same aunt. Emily was awed that I made such beauty. I have purchased so many hoops and they all end up in the attic!! I LOVE this blog! Thank you and happy stitching to you! As I was reading your post I smiled all the time! Do you remember your long and short stitch lessons? As a good pupil I used a hoop… it was hard but I used it and I think for this kind of stitches is better using a hoop. I never use a hoop, i embroider in hand even satin stitch. In Portugal (Madeira is Portugal 😉 ) hoops are not used only for large drawn threads – Only Embroidery of Castelo Branco is made in frames or hoops because the threads used are just and only silk threads! Have a great week and I love the work you are doing – I love monochromatic embroidery. I have tried many types of hoop and frame but now generally work in hand. I find my tension is better that way as with a hoop or frame I tend to over tighten my stitches. I do all types of embroidery , from hardanger to free style surface embroidery. I do think it is a personal choice and whatever works for you go with it. It is wonderful to see this! I use a hoop for some stitches (and when I do use a hoop, it is a sit upon, so I can use 2 hands), but do most of my embroidery ‘in the hand’. I have been very fortunate to have been to Madeira twice, and taken lessons from some of the ladies at the Imperial Bordados (sadly, no longer in business). They taught us that the first motion that you learn as a child is to eat, and that is how they stitch, holding the sharp point of the needle towards them. They used a 7 Between (although we used a 7 sharp, as it is a bit longer) and floche (yummm) to stitch all of their embroidery stitches, except for the pin stitch, which they used regular thread. The way the fabric is held taut takes the place of the hoop, so there is not a problem with the fabric pulling up and not laying flat after the stitching was finished. I am fascinated by your comments. I have begun working in the hand when I use madeira type stitches, buttonhole, small satin stitch, stem stitch etc. I have searched for months for a finger guard which I find necessary for proper tension. The only place I found for them is Lacis which is too bad as their customer service is not good. I would love to hear any more comments you may have on how to manipulate the fabric and needle. My book, The Embroidery of Madeira, lists the stitches and equipment but is silent on actual stitching techniques. Thanks so much for your help. This reply is for Marilyn! The embroideresses that we worked with in Madeira all used a thimble (although I don’t – I did not learn with one and have never gotten used to using one). For a finger shield, I use the plastic that is used to cover benches, picnic tables, etc., that you get at Joann’s for about $3/yd. Cut a piece or plastic that is eide enough to go from the tip of your finger to the knuckle (you want to be able to bend your finger) and long enough to go around about 1 1/2 times. Take a piece of electrical tape and tape it together. You can also use the Wonder tape (stitcks to itself) and trimit to fit your finger. You don’teed tape to hold it in place. The great thing about these finger shields is that as you wear them, the plastic warms up and becomes malleable – part of your finger! It gives plenty of protection without being stiff an uncomfortable. I even forget I have mine on when I am finished stitching. I will try toget a picture of that posted on my blog. As far as manipulating the fabric and needle – they taught us to always point the needle towards yourself as you are stitching. Manipulate the fabric so the design is in the direction to be able to do that. Hope that helps! Working in the hand to be a good choice for stitches that can be sewn as opposed to stabbed. 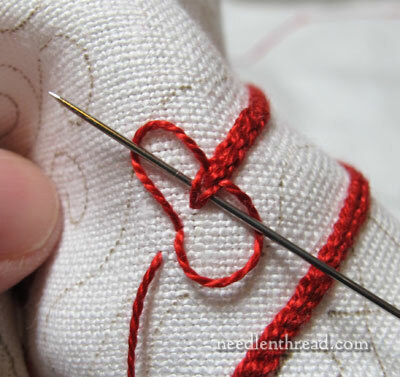 Small satin stitches (such as for Hardanger) can be done in the hand. Long laid stitches are best kept for a hoop or frame though. The fiber also makes a difference: wool (especially on wool fabric) is very easy because it is a forgiving fiber. You can steam out minor tension issues. Cotton doesn’t take as well to steam but still simple to embroider in hand. I second the idea of rolling the fabric to fit it in your hand. Also be prepared to turn your work much more than if it was in a hoop or frame. Finally, I wash my hands about every 1-2 hours when embroidering in the hand. That may seem like a lot but it keeps the embroidery clean. I was so excited to see that you were going to do this project “in hand”! I was wondering from the get go how you were going to mount the project in a frame and for me just a little amateur stitcher I felt like this was going to be a project beyond what I was capable of doing. Now that you are doing this in hand it gives me some thought that I could do something like this as well!! I have always embroidered with a hoop. This is how I learned as a little girl from my mother and grandmother. Thanks for making this so fun to follow! I do use a hoop when I have to, like with the Nesting Place project earlier this year. I think I work equally in hand and using a frame or hoop, just depends on the type of stitches I am doing – some stitches are much easier in hand, IMO. I have at times stitched without a hoop. When I do, I gently roll the section not being worked on and secure it so if I need my left hand the fabric stays organized. I love to stitch using a floor stand so that I can stitch 2 handed…dominate right at the bottom and left on top. I have recently stopped using a hoop when doing counted cross stitch. I find it much easier. I wish I had done this years ago! But I was taught by my old-school mother to always use a hoop. Oh, well! I think it is much easier to handle the fabric. I don’t have to worry about where to put the hoop so that it doesn’t mash previous stitches, but I can still reach the unstitched parts. Also, I think the finished product looks better. The stitches seem to blend together better. Best of all, I don’t have to worry about rebuilding the callus on my middle finger from pushing the needle through. (I don’t use a thimble. Never could get the hang of them.) It is much easier to push the needle through when working in hand instead of with a hoop. Just my two cents worth. I am really looking forward to seeing your runner. Red is my favorite color, so I am sure I will love it. Keep up the good work! I actually prefer to work without a hoop. My tension is better because I can feel if I’m pulling too tightly or not enough. I find it easier to get stitches the correct length. I like the feel of the fabric and thread in my hand. When I do use a hoop I find it awkward and quite painful on my hands. Nonetheless, there are some times when a hoop is needed and I do use one then. My preferred embroidery is surface embroidery and for that I definitely don’t use a hoop. I’m a newbie to proper needlework, but have almost always used a hoop…mainly because I hadn’t considered other ways. I’ve imagined the ‘in hand’ method creating problems as the turn of the cloth creates a different (curved) surface which will ultimately end up being flat. This is a very interesting article, and the discussion valuable to me as I try to improve my hand embroidery. Thank you very much for your article and facilitating this discussion. Linda, the “curved surface” issue you mention is the thing that concerns me, too. I would like to stitch in hand, since these days, my left thumb gets crampy grasping a hoop. But I’ve always worried that once the project is laid flat, the stitches would somehow “bubble.” I’d be grateful if someone who stitches in hand could address this. Thank you, Mary, for this topic…and your entire blog! I never miss a day. When I learned to embroider many years ago, I always used a hoop. I did many dishtowel sets that way. Nowadays, however, I usually embroider as a means of holding raw-edge applique pieces in place. I’ve used a two-sided backing on my applique pieces, so by the time the piece is assembled and ready for embroidery, it’s already pretty stiff. Plus using a hoop would probaby cause some of the applique pieces to come loose. In my experience, the applique/embroidered pieces have come out okay with regard to tension, etc. With practice, the tension becomes much less of an issue. I call it a crewel embroidery piece although technically it might not be that. The only time I use a hoop is when I want to use a satin stitch. I love the fell of the fabric in my hands. I find it easy to work with small hoopsup to about 6 inches. When it gets to much larger, I find I have trouble reaching my work so sometimes try without hoop. Sometimes the working fabric will pucker due to my lack of tension regulation but, if I pay close attention while working I have no problems working without a hoop. Over the course of 50 years working embroidery I would say I have used a frame of some kind for 95% of the work that I have done. I possess several hoops and two rectangular frames so normally find something that will fit the size I am working. One tip I will pass on is to have a screwdriver in your workbox to tighten the tension of your frame. So many embroiderers today don’t tighten their hoops enough, they should be drum tight. I also advise taking the frame off the work or at least loosening it if you are leaving the work for any length of time. There are certain embroideries that can be worked without a frame but they are few and far between and certainly anything that needs counting should be worked in a frame. I use a hoop. I didn’t use one for the longest time. But, time and arthritis took its toll, and I can no longer grasp the fabric the way it needs to be grasped to keep the stitches nice and even. So, I moved on to a hoop. Well, actually it is a Q-Snap. It took awhile to get used to, but now, when I have to stitch without it, I feel lost. I do Thread Painting(needlepainting) and find that I can do the outline stitches better without a hoop. But to do the long/short stitch a frame or hoop works better for me. I never use a frame when I do Hardanger as I find that the stitches are distorted when released from a frame I also find my hand goes into spasm I find I can also sit more comfortable resting a very painful back against the chair back. I had my frame for some time (it is made by the husband on one Lithuanian cross-stitcher), but I disliked stitching with it. I was using a hoop or, sometimes, stitching without any such helper. But when I was stitching my Tudor and Stuart Gold Master Class sampler I understood, that I must use my frame. I have no other possibility. And I liked it very much. No I have two frames (made by two husbands of Lithuanian cross-stitchers; this is how we tackle the problem of expensive frames – ours are much cheaper) and I use them very often. But sometimes I work without any hoop or frame. Especially while stitching some bigger tablecloths. For many years I only did my needlepoint “in hand” & I stuffed it in a bag and carried it everywhere. Then I took a couple classes w/canvas on frame, learned more complicated, fussy stitches, & had EVERYTHING on stretcherbars-then I graduated to Evertites. Now I know I “need” an in-hand project around, probably w/basketweave to do, so I can stitch and not have to think/worry so much. The in-hand is very soothing. So I do both. Haven’t tackled a trestle frame yet- worry my neck/shoulders will kill me from holding a 20# bowling ball(AKA my head) up over the frame. 1. More holes for the top rung so that I could achieve a greater variety of angles. 2. Decreased the height of the center rungs. I’m short and this allows me to set the frame so at I can easily rest it mid chest – thus allowing both arms to easily reach above and below without leaning into the frame, or oving it lower when I wish to work with both hands on top. I hoop or frame my work. I was thinking of wrapping a hoop with something like velvet ribbon or the non-hooked side of velcro to see if either would help with my coarse feed-sack projects. I’ll let you know. I used to use a hoop or frame for everything, because the work I’d seen from those “in hand” diehards really didn’t look the best. But over the past 6 months or so I’ve gradually been taking all of my projects off their frames, mainly because the projects were large and the frames were cumbersome, and been much happier as a result. I find it faster to work in hand, also easier to stitch accurately. I know I will have to go back to a hoop for some projects, but I have to admit I’ve been avoiding them! I was also amazed, when I started stitching in hand, how sore my left hand and arm became! I have realized that it is partly from using new muscles, and partly tension from concentrating on learning a new skill. Lately I’ve tried to be more concious of what the rest of my body is doing when I stitch! That is how I was taught how to embroider, without a hoop. I was in the second grade. Here in Portugal (as you and Meri so rightly mentioned) no-one seems to use hoops/frames (the latter aren´t even available where I live) except when doing drawn thread hems- even in embroidery classes. As a result some of the work, because of the inconsistent tension, looks very skew. However, on the positive side, everything comes right after washing and blocking/ironing! I´m versatile, depending on the type of embroidery I´m undertaking (eg am doing Richelieu at the moment without a hoop). I think beginners would benefit from starting with hoops but should feel free to use whatever method is more comfortable for them. I do! I like to do most of my work in a hoop. However, I do a lot of applique and I do that in my hand. When I add embroidery to the applique, I have to do in it my hand to keep from having the hoop crush the applique. Following your project makes me want to start the project and follow along with you!! I better read up on what you are embroidering on!! I have a question. I have volunteered to embroider a number of spiders onto an appliqued quilt for a friend. Some of it is already hand quilted where the spider will go. Other parts are just basted at this point. I’m afraid of hooping the appliqued top, since I don’t want to squash the applique.—Any suggestions???? I really enjoy your expertise in embroidery and your willingness to share it!!! Interesting post Mary. Years ago, I tried to learn embroidery using a hoop and was not successful at starting and ending thread on counted cross projects. Last year, I watch my sister n law stitch in hand, which I never heard of. She taught me the loop method to starting thread and whamie, I am hooked on embroidery. Then, through the Nesting Place class, I learned about evertites, and I have a few of those bars to use with surface embroidery because it seems that I need the tension it provides to execute the stitches properly. I like those much better than hoops. I am finding that I have an in hand WIP in a bag along with a small kit of supplies, so that I can grab and go. This is a simple project that can be done while waiting in the car for children. The crewel work and surface embroidery projects are on the evertites. Regarding the hands — When stitching in hand, I find that my left hand (I am right hand dominant) is very sore the next morning after stitching the night before (?maybe I should break up my stitching time???) Anyway, such woes are worth it when the project is finished! Stitching without a hoop is very enjoyable to me. I can sit in any chair, in any position or snuggled up in bed and still stitch. No sitting at a frame or trying to move my hoop around. There are cases where, I feel, hooping is necessary, but when it is not…do without. Embroidery on felt is one case where I feel hooping would do more damage than good. Yes, the fabric does tend to get wrinkled and bunched up when holding it in your hand…but most everything can be blocked after stitching. I almost never use a hoop for crazy quilt embroidery. There are often too many other embellishments in the way of the hoop on a CQ block. The only time I would use one is if I’m working a motif on the center of a patch that has not yet been pieced in to the block. What neat work…I feel blessed to know you, Mary. Hi Mary, I have learned so much about embroidery from your column and look forward to reading it each day. I am one of those who almost never uses a hoop. I have some arthritis in my thumbs and find a hoop painful to hold for any length of time…perhaps that is an excuse to look into a frame on a stand, but I also enjoy having a ‘portable’ project that is always with me when I have those unexpected moments to stitch during the day. As a child, I learned to embroider without a hoop. I never used a hoop until I was in high school and was learning to do crewel embroidery. Now, it depends on the project whether I use a hoop or not. For some stitches, I like the ability of rolling the fabric around me finger to get the stitch just right. 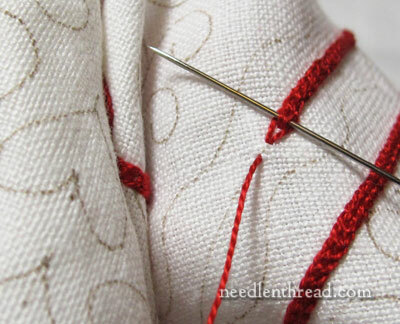 You can use the stitching method, putting the needle into the fabric and back out, rather than the stab method of pushing the needle to the back side and grabbing it underneath to pull it through then push it to the front side again. Sometimes when I have a project on scroll bars, I will loosen the fabric so I can do the required stitch rolled over my finger. Mary,, your work is stunning. I normally work in a hoop or frame and find the beauty of the piece and ease of stitching great, especially in silkribbon work. In working with a hoop I find if you spray a light starch on the linen before you transfer the design it not only puts a protective barrier but allows it to form a barrier for removing marks as well as helping cut down on hand oil transfer. I have also seen where you trace your hoop, and then leave a cut out circle or square and place it on a piece of blank light muslin. 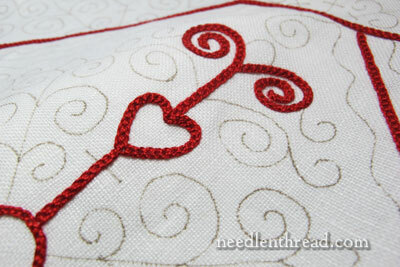 Stitch around the circle or square with a satin stitch and lay this over the piece and move it along as you stitch. I also place my work on a work pillow in my lap and it makes it a lot easier on my arms and hands. I prefer to work without a hoop, QSnaps or scroll frame. Obviously on the larger patterns I have no choice since too much extra fabric flopping around drives me batty. But the smaller things (12 inch square or less) I like to work in hand. I tend to roll the extra fabric from the left and hold it in my hand that way, fewer wrinkles. And I love to stitch from different directions (even in cross stitch – I’m used to keeping thread directions straight in my mind). For some reason, whether it’s embroidery or quilting, I can’t seem to stitch all different directions when the fabric is held in one place. I turn the fabric as I go round curves. Otherwise my stitches look very irregular. Helpful hints on that skill? Interesting post and comments, I thought that everybody now embroidered with hoops, but it seems I was mistaken. I learnt to embroider without a hoop, because my mother never used one (she used to embroider sheets in satin stitch), but nowadays it depends on what I’m working on: for chain stitch or split stitch I do it in hand, but for the rest I use a hoop. I used a hoop or roller frame/stand exclusively with cross stitch, embroidery on linen since the late 1970’s. But in the last few years I will get shoulder pain from the larger arm movements using a stand. So I only use frames and stands with needlepoint and everything else in hand. I’m far more aware of ergonomics as I’ve gotten older! I’ll still get a sore shoulder from too long a stitching session, so I break them up into shorter segments. What a timely article! I have been trying to do a current surface embroidery project in hand and it just feels so awkward! I can’t imagine doing counted cross stitch in hand … at least not the projects I’ve done. How can you properly count when the fabric is all bunched up? I do white work without a hoop but use one for other embroidery. Sometimes you can roll your fabric up to the point where you are stitching to cut down on the rinkles. And yes my hands sometimes get tired or crampy, then I have to do something else for a while. But I’m back at it as soon as possible. I also keep my work rolled up with another cloth to protect it and cover it. This helps markings from fading a lot if the markings aren’t permenant. What an interesting post! I will work in a cheap plastic hoop, a nice wooden sit upon hoop, my Millenium frame, or Evertite frames. It all depends on the project, as you and so many of your respondents have pointed out. The hoops are for the items that can be washed, as the hoop marks, whether dent or dirt, never seem to come out unless thrown in the washing machine. I use the frames for complicated pieces that I am not too sure how to work, so I can have my hands free. Thanks for this post, most informative. I also generally work without a hoop, bars etc. I usually am working on CCS and assorted stitches on linen. Currently doing a DARNing project. Have to use a hoop (and magnifier) and yes, I spelled it that way on purpose! Will probably be my only DARNing project ever and I’m so glad I don’t have to darn my clothes or socks! I like to stitch on velvet with stranded silk threads. Because velvet crushes I never use a hoop. I think I world have trouble going back to using a hoop now. in my case it is a matter of embroidery I did so far. I did Richelieu, Hardanger, Sashico embroidery and never used hoop or frame for that. Actually, I feel good when I can keep the fabric in my hands. However, recently I started to learn long&short stitch and to this I think hoop is a must. I have just started embroidering and for my first few pieces I have only worked on small pieces like – Bibs, tea costers, coin purses and a glasses case. I am so excited about embroidering that I sew for hours on end without using hoops/ frame (only because these pieces are so tiny that no hoop fits them), and I find that my hands really hurt at the end of the day. I really really love your work, especially this project! I think that it took you a lot of time and patience. I would love to know how much time did ou spend on this project? I love to start it on my own but I’m afraid that it make take me forver to finish it! Thank you so much for your blog! I’ve done everything crafty, and when i picked up a beautiful embroidery pattern i somehow misplaced my hoop. So i went to thinking “Why even use a hoop?”, and i found your blog! My fabric is very stiff on its own so i knew a hoop wouldn’t be necessary. Also, I’ve done embroidery work on my crochet pieces! They can’t be “hooped” at all, especially my sleep masks. So thank you for the encouragement! I will now pick up my embroidery pattern without a hoop. Hi Mary, I have been doing embroidery for many years and most of mine are done with no frame. The only time I use a frame is when I do back stitch and x stitch. When I don’t use a frame, I have a cushion in front of me or on my lap to lean my arms on. It is much kinder to your neck and shoulders I find. Mary: Can you tell me the type of cloth and thread you are using for the Hungarian Table Runner? I would love to make one and want to use what you show here I think it is beautiful. I am teaching myself using all of your tutorial stitches. I am so thankful that you do the videos for each of the stitches. That format is very helpful for me. I have worked with needles and thread/yarn since I was about 5 yrs old. Mom believed in getting us started early. Whether I use a frame or not depends on what I am doing. I like the no-hassle of just throwing my piece on a frame and just concentrate on the design. I do a lot of counted design work. Free stitching from time to time. No matter which style I’m using, I hate wasting material (I use some unusual materials to work on), which brings us to corners. I have yet to find ANYTHING that will hold a corner in tension – other than my hands. So personally I use both though I prefer the frames that look like pvc pipes. VERY easy to work with. Would you please tell me the name of the thread that you are using on this pictures? I’m a beginner and I bought the normal 6 strand thread, but I’m looking for a thicker one strand like the one you are using here. Hi, Breena – it’s DMC #8 Pearl cotton. It doesn’t come in a skein – it comes in small balls. Limited colors can be found at local craft stores, but you can find more extensive colors online through places like Herrschners. Hope that helps! Thanks for the nice pictures and the Agnus Dei post! I started appreciating embroidery because of my fiancee. She embroids ribbon-belts for wedding dresses but she’s complaining about mysterious back issues. I’ve watched her work and she is in some trance while embroiding. But she looks completely hunched and crumpled up so I suspect her issues coming from this bad posture. Any ideas how I can help her with this? Is there a frame from something long and narrow as a ribbon? Maybe one of those magnifying glass lamps? I never ever use a hoop or frame. I have tried and because I have Parkinson’s the tremors are amplified with frames. I know the importance of keeping the thread taught, but it just seems awkward and clumsy to work with a frame. It’s hard for me to hold, so draping the fabric comes more natural to me. I do cross-stitch and some blackwork/assisi on linens and evenweaves. I haven’t noticed any problems with it thus far. Next Next post: Blissful Beginnings – Winners Announced!